On the Teleportaloo: Oregon State Fair Pictures! Dogs, Piggies, Goats. Oregon State Fair Pictures! Dogs, Piggies, Goats. The Oregon State Fair was everything I expected it to be: terrible food, fun animals and scarily maintained fairground rides! 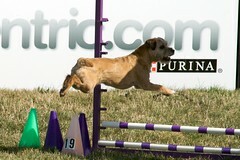 I loved the dog agility trials. I wonder what a Great Dane would make of all the jumps and stuff? I created a Flickr set of my favorite pictures.